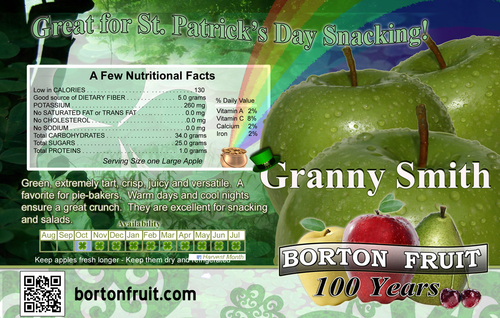 Borton & Sons, Inc. is one of the largest Granny Smith Apple Growers and Packers in the Country. This year’s crop has produced an excellent quality piece of fruit. 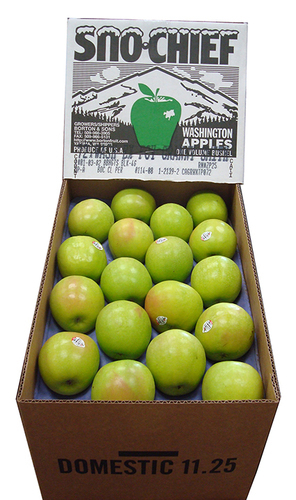 “The unusual aspect of our Granny Smith production this year is the higher percentage of larger apples, 72 count and larger. We have a need to move more customers into these larger sizes, in comparison of our 3lb and 5lb bags. 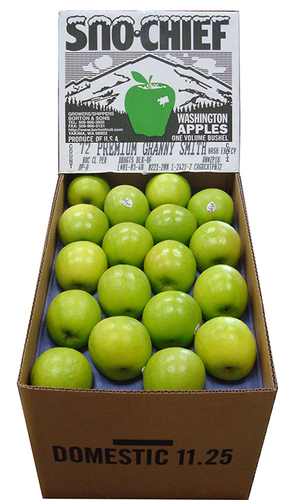 The best deals on high quality Granny Smith are in the large tray pack apples of the Premium “all green” grade and WAXF grade with slight blush (seen below).” States Sr. Sales & Marketing Manager, David Whiteside. With St. Patrick's Day right around the corner, what perfect timeing to take advantage of these "Best Deals" and get some GREEN Granny Smith Apples on Display right away! Please contact your Borton Sales Rep today to take advantage of this opportunity. Like the St. Patrick’s Day Varietal Card POS below? We can email this to you to print, or with enough notice, can print and send them out to you!